Visit our specialty themed tours for more exciting ideas on exploring Tibet and Bhutan. 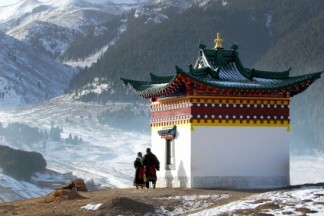 Discover the Tibetan Plateau and pilgrimage to Mt. Kailash, Tibet’s sacred mountain. Take a train from Beijing to Lhasa. Celebrate the return of the black-necked cranes in the Phobjikha Valley in Bhutan. Trek to Laya. However you choose to explore Tibet and Bhutan, you are guaranteed a magical journey! True Traveler’s Tale: Rebekah and Michael explore Bhutan’s mountains to Beatle’s tunes!